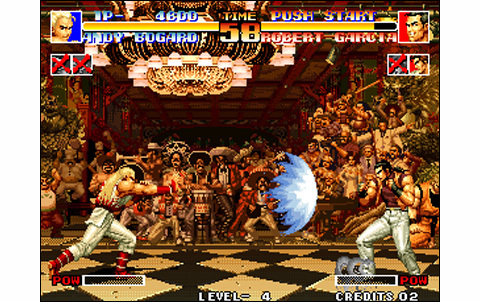 The King of Fighters is probably the the most famous 2D fighting game franchise, along with Capcom's Street Fighter series. 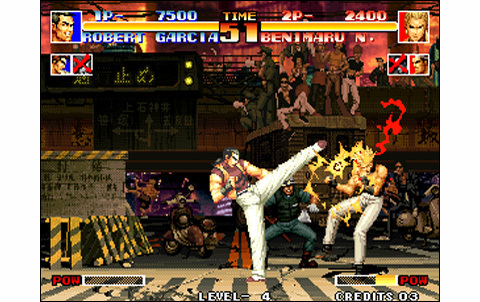 These were born in the early nineties and made their way to the summits of the arcade world... Inaugurating a new fighting system using teams of three contestants, KOF - it's the nickname of the saga - brings a brand new technical gameplay, requiring a very precise timing and complex combinations. 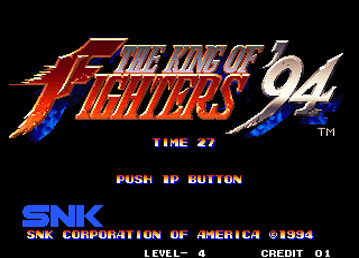 When this SNK baby hits the arcades, the soft is a true revelation back then for VS fighting amateurs. 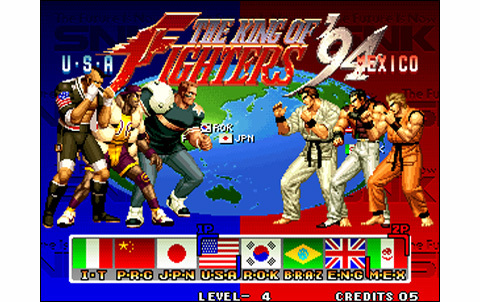 Featuring a marvelous roster of twenty-four characters, Kof 94 is the N°1 game in terms of variety. No competitors in this era were packing such a big cast of characters. 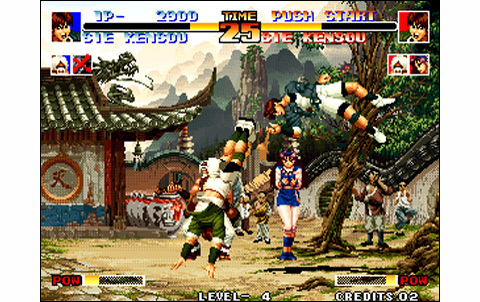 If you can't yet edit your own team (team of three pre-committed), it is nevertheless still possible to play the classic one-on-one system with two winning rounds, like before. 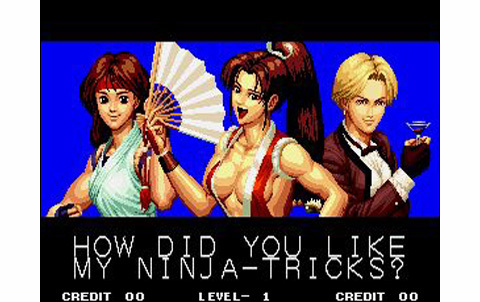 But the biggest innovations in Kof remain the fact of opposing teams of three fighters together, including in the gameplay a deep strategic dimension, and featuring the most famous warriors of SNK fighting games. 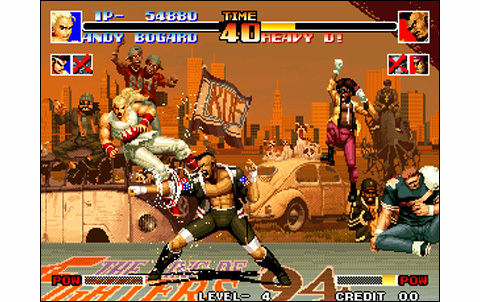 The soft brings together the heroes from Fatal Fury and Art of Fighting series. 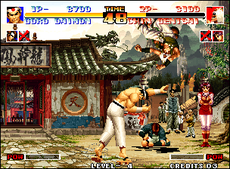 A grande première in the small world of fighting games! 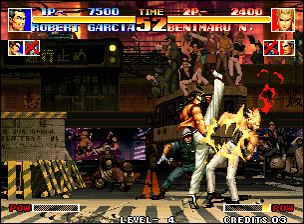 Here with The King of Fighters 94' wasborn the 'crossover'. 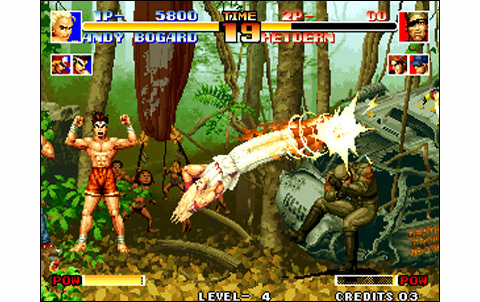 It consists in putting together characters of one VS fighting game and characters from another one. 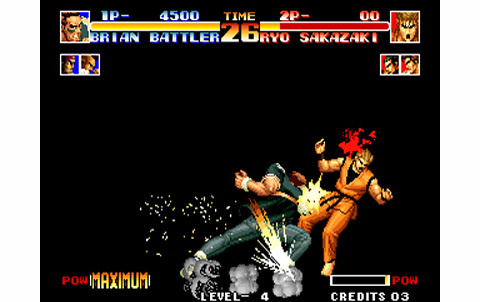 Capcom will also try this later, with its famous X-Men Vs Street Fighter series and of course Capcom VS SNK. 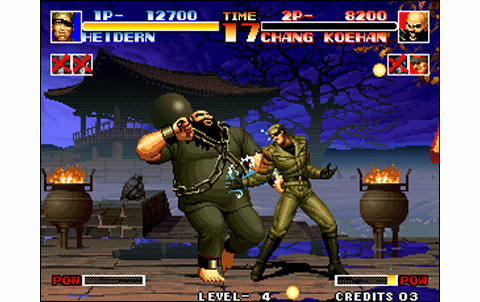 In Kof 94, some warriors are coming from other SNK games (Athena from the eponymous game, Heidern, Ralf and Clark from Ikari Warriors) and a few brand new fighters such as Lucky, Heavy D, Brian, Chang, Choi, make their entrance. 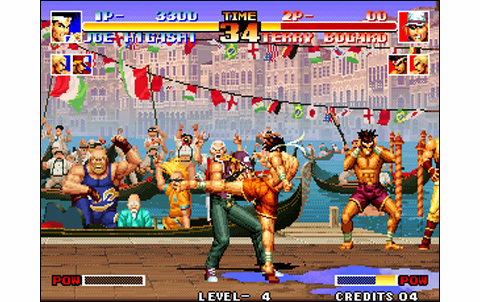 The King of Fighters 94' tournament takes you all around the world: Venice, the brazilian jungle, New York, a chinese village... The graphic style, designed with pure "pixel art", is very personal and original. 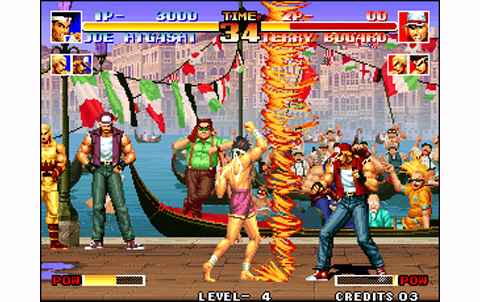 Indeed, nothing to do with Fatal Fury and Art of Fighting: here we inaugurate a new style, more 'realistic' and pleasant. 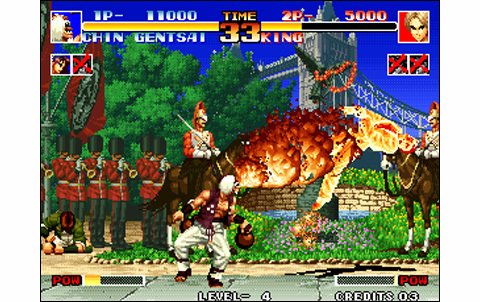 While standing as the simplest King of Fighters game of the series, the pleasure of fighting is intact. 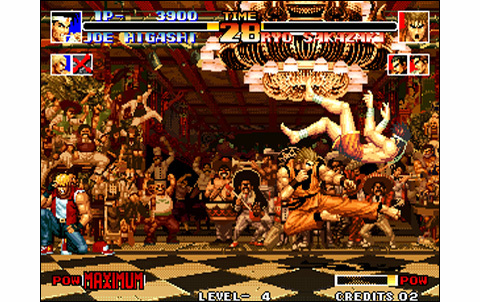 As mentioned above, there is a certain stiffness in the characters, but nothing insurmountable. 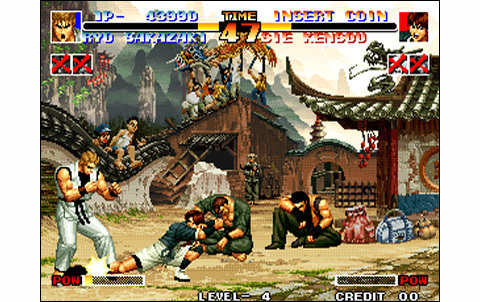 Each stage features a short introduction, which is a detail that usually pleases a lot of aficionados, while it also packs much animations in the background. 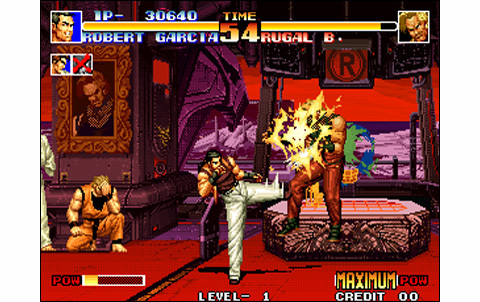 The character design, quite simple, is very successful and appears as a subtle mix of Art of Fighting and Fatal Fury, in a remarkable symbiosis. I haven't talkt about life, but as the game packs no less than with twenty-four characters, you can imagine that this was a model of its kind. 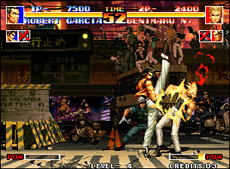 Its combos are legion, basic moves and specials as well. All this requiring strict timing! 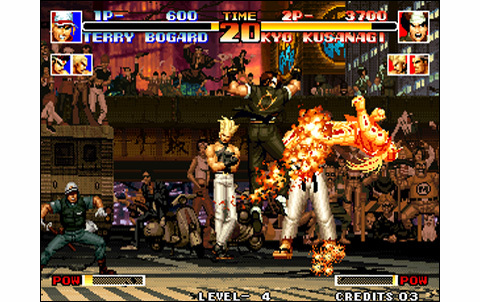 If the single game is not easy to come through, versus, as in all Kof, promises many hours of joyful brawl, and room for improvement never seen before in a fighting game ! 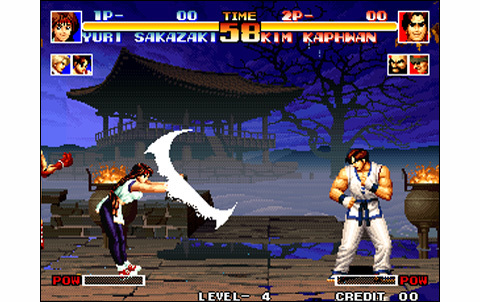 KOF 94 starts from zero: more "realistic" and full of details, it will please all real 2d lovers. Only flaw, too few stages! Fluid and fast, but a little stiff. Backgrounds are particularly alive, and visual effects are great. Without being the top on the system, it's still a beautiful soundtrack. 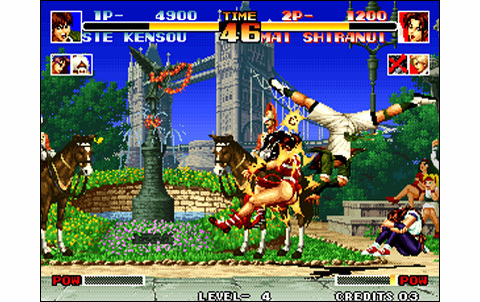 A huge twenty-four characters roster featuring charismatic fighters, plus the possibility to play teams of three warriors: the cream of the crop, back in 1994. Technical and speedy, gameplay offers top-notch brand new basics, but improvements will still be done. 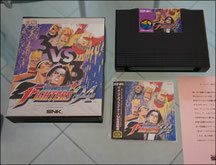 The first game of a great franchise, losing some of its glory to its successors, but standing as a fabulous game. Available for only thirty euros in any good videogame shop, believe me, you won't throw your money away in investing in this legendary game. 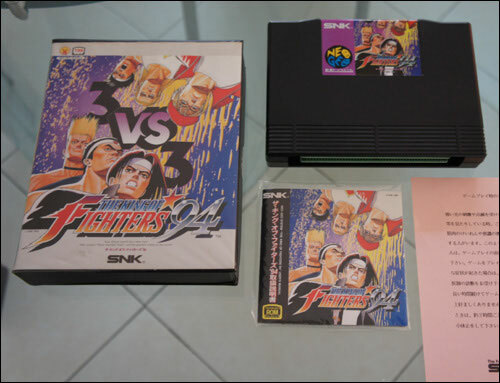 It's the first KOF but it has it all, plus the "old-school" factor. Start with this episode before the more recent ones!